Access to HIV medication has significantly reduced the number of AIDS related deaths in Africa. Yet in a number of African countries one in four HIV infected still dies within the first few months of commencing treatment. One reason for these deaths is malnutrition which causes the HIV-virus to develop more aggressively. Now a team of researchers from University of Copenhagen, Denmark and Jimma University in Ethiopia have shown that a dietary supplement given during the first months of HIV treatment significantly improves the general condition of patients. Their results are published in the journal BMJ. Roughly 25 million Africans live with HIV, many of whom now have access to antiretroviral treatment (ART). ART has reduced the number of AIDS-related deaths greatly, but several African countries still report very high mortality rates within the first few months of treatment. One of the main reasons is malnutrition which is common among patients starting medical treatment. 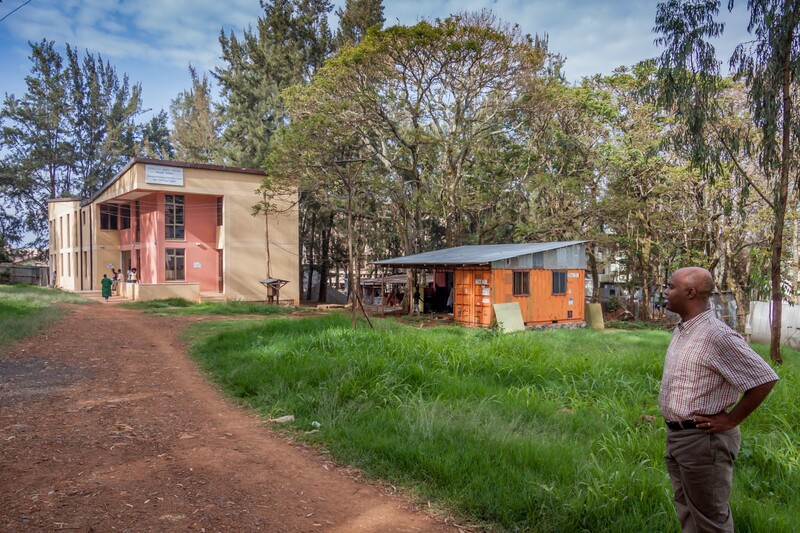 A collaborative project between the University of Copenhagen and Jimma University, Ethiopia, has demonstrated that daily nutritional supplementation for the first three months of ART considerably improves the condition of HIV patients. The results have just been published in the scientific journal BMJ. PhD-student Alemseged Abdissa in front of the HIV clinic (left) and the study clinic (right), at Jimma University, Ethiopia. Download free press photo. "Patients gained three times as much weight as those who took ART without the nutritional supplement. And, in contrast to the medication-only group, the supplement takers didn’t just gain fat – a third of their increased weight came from gained muscle mass. Furthermore, grip strength improved, and thereby the ability of patients to maintain their work and manage daily tasks," says PhD Mette Frahm Olsen, who is one of the project researchers and together with Alemseged Abdissa, the main author of the BMJ article. "The immune cell types typically suppressed by HIV were restored more quickly in patients who received a whey-containing nutritional supplement. In conclusion, the effects of the supplement were measurable, and very relevant for HIV patients living in countries where malnutrition is common," continues Mette Frahm Olsen. For three months, patients received a daily supplement of 200 grams of peanut butter to which soy or whey protein, along with other vitamins and minerals, was added. The advantage of the supplement is that it is rich in energy and nutrients and low in water content, allowing it to be better preserved in warm climates. The supplement was originally developed for severely malnourished children, but modified for the research project to satisfy the needs of adults living with HIV. "We know that malnutrition fuels the AIDS epidemic, in part because poor nutrition facilitates the virus’ attack on the human immune system. But today, the significance of nutrition is often ignored because patients gain weight while being treated with ART. As a result, a patient’s doctor may believe, mistakenly, that the patient’s nutritional state has been normalised. However, if the patient has not had an adequate nutritious diet, the weight increase may be without benefit and consist mainly of fat," says PhD Mette Frahm Olsen. The research project also demonstrated that it is possible to integrate short term nutritional supplementation into the lives of Ethiopian patients without disrupting cultural, social and religious practices regarding diet. The research project took place from 2010-2013 in Jimma, Ethiopia. The research group consisted of researchers from the Pediatric and International Nutrition Unit based at the University of Copenhagen's Department of Nutrition, Exercise and Sports, in conjunction with researchers from Jimma University Specialized Hospital, Odense University Hospital, UCL Institute of Child Health and the University of Cambridge. The project was funded by the US Dairy Export Council, the International Atomic Energy Agency and DANIDA. The results have been published in the BMJ.